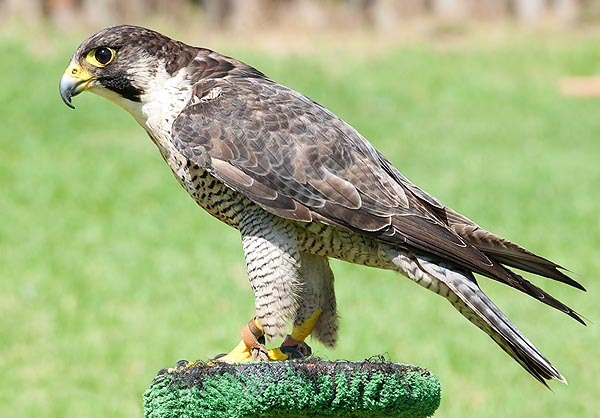 The Peregrine falcon or Falcon (Falco peregrinus Tunstall, 1771) is a diurnal bird of prey leading to the order of the Falconiformes and to the family of the Falconidae. Its nidification area is quite large. It covers almost all Europe, most of Asia, Africa, Oceania, North America and the extreme south of South America. They are partial migrators; some of them, especially the young ones, with the arrival of the cold season and of the bad weather, migrate south, reaching even the Tropics. Quite numerous are the subspecies in which the good species or the holotype Falco peregrinus subdivides, each one is characterized by its own range as well as by being a total, partial or settling subspecies and having, therefore, much different reproduction and wintering locations. The various subspecies characterizing the Falco peregrinus are nineteen, which are the ones accepted by the Birdlife Society and by the International Commission for Zoological Nomenclature (ICZN). Falco peregrinus japonensis Gmelin, 1788. It is the Japanese peregrine falcon, called also Falco peregrinus kleinschmidti or Falco peregrinus pleskei. It is autochthonous from north-western Siberia to the Kamchatka Peninsula (Russian Far East), up to Japan. The Japanese subspecies is sedentary; the north-Euro Asian ones are migratory. Falco peregrinus peregrinus Tunstall, 1771. The reproduction locations are placed in the temperate belt of Eurasia, from the Pyrenees to the tundra, from the Mediterranean Sea to the southern Alpine belt. The Asian and Scandinavian subspecies are migratory, the European ones are sedentary. Falco peregrinus calidus Latham, 1790. It reproduces in the Arctic Eurasian tundra and in Siberia; is migratory in winter, its wintering locations are placed in the sub-Saharan Africa, where it lives in the humid zones, such as the marshes with reeds. Falco peregrinus peregrinator Sundevall, 1837. 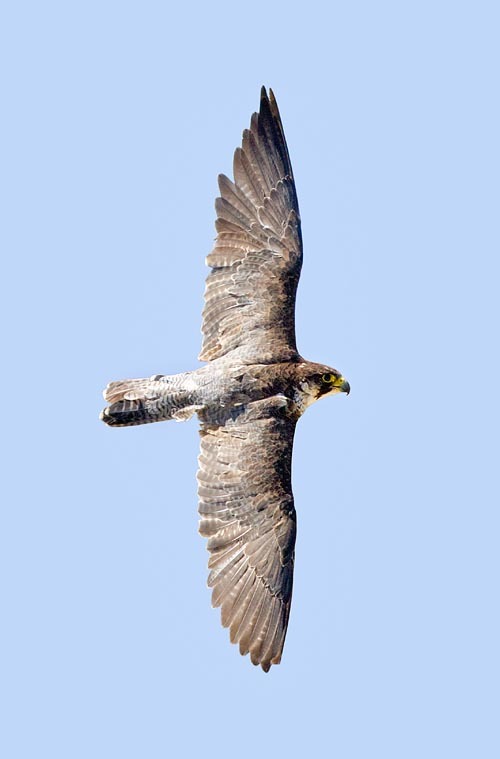 This is the Indian peregrine falcon, at home in southern Asia, from Pakistan to India, Bangladesh up to southern China. It is not a migratory subspecies. Falco peregrinus macropus Swainson, 1837. It is the Australian peregrine falcon, autochthonous to whole Australia, but the south-west. It is not a migratory subspecies. Falco peregrinus submelanogenys Mathhews, 1912. The Southwest Australian peregrine falcon. It is not a migratory subspecies. Falco peregrinus cassini Scarpe, 1873. The Austral peregrine falcon. Sedentary subspecies, it includes also the leucistic species, the pallid falcon. Its home range is in South America, where is found in Bolivia, Argentina, Chile, Ecuador, Patagonia, Tierra del Fuego and Falkland Islands. Falco peregrinus anatum Bonaparte, 1838. Bonaparte, 1838. 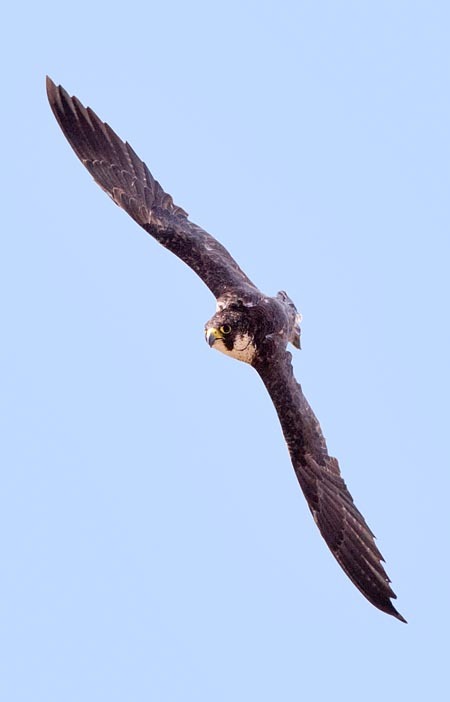 The American peregrine falcon, or Duck hawk, autochthonous to North America, from the tundra to northern Mexico, as well as to the Rocky Mountains. Some vagrant specimens may reach north-western Europe. Falco peregrinus tundrius C.M. White, 1968. Autochthonous to the Arctic tundra of North America and of Greenland. For wintering, it migrates in Central and South America. Falco peregrinus palei Ridgway, 1873. The Peale’s falcon, autochthonous to the north-western American Pacific Ocean, from the Puget Sound to the British Columbia. It is not a migratory subspecies. Falco peregrinus minor Bonaparte, 1850. Autochthonous to few sub-Saharan areas and to the South Africa, it ventures up to the Moroccan coasts. It is not a migrant. Falco peregrinus madens Ripley, Watson, 1963. It has a sexual dichromatism. Autochthonous to the Cape Verde Islands. It is not migratory. Falco peregrinus brookei sharpe, 1873. The Maltese or Mediterranean falcon. It is not migratory. It is autochthonous to the whole Mediterranean are, starting from the Iberian Peninsula to the Caucasus, where it is absent only in the most arid zones. Falco peregrinus madama Hartlaub, 1861. It is present only in Madagascar and in the Comoro Islands. It is a non-migratory subspecies. Falco peregrinus furuitii Momiyama, 1927. Endemic to the Ogasawara and Izu islands, in Japan. It is a rare subspecies, not migratory. Falco peregrinus ernesti Sharpe, 1894. It is not migratory, present in the Philippines, southern Papua-New Guinea and the Bismarck Archipelago. Falco peregrinus babylonicus Sclater, 1861. Autochthonous to eastern Iran, along the Hindu Kush Mountains. They hibernate in the north of India. Falco peregrinus nesiotes Mayr, 1941. Not migratory, autochthonous to the Fiji, Vanuatu and New Caledonia islands. The falcon is especially numerous in the rather large woods and in particular in those where are present rocky walls. It is found also in the mountains, in the barren regions and along the coasts. At times, it is observed even on the belfries of the churches and on the towers of the castles. Usually, it is always attracted by the most inaccessible vertical walls. However, it finds also the way to adapt and nidify also in the tundra of the boreal hemisphere, for instance in the Samoyed (or Saamod, Saamid) Peninsula north of the Urals and of Siberia, even if these do not offer him rocky walls. 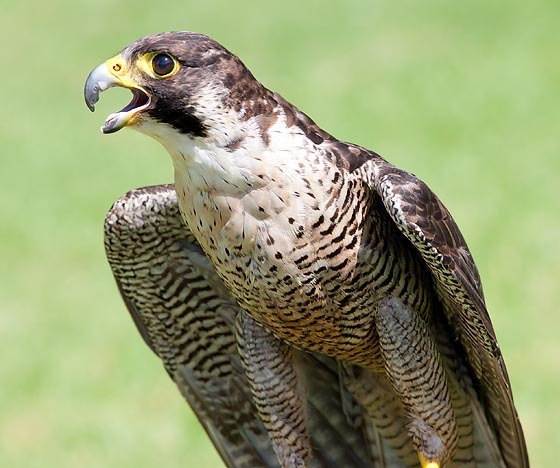 The peregrine falcon is a robust, bold and extraordinarily agile bird. Its flight is fast, with strong wing beats, but hardly rises to great heights. When it takes off, it opens the feathers of the tail, covers a short distance close to the ground, and then rises up. Of cautious and suspicious temper, it prefers to spend the nights in the pine forests or in the woods with tall conifers; if these do not exists in the regions where it lives, then it rests on top of a rock. When in the tundra, little populated biotope, the falcon is ferocious and greatly fears the human being. On the contrary, in the cities where it has accustomed to the human presence, it becomes unbelievably brave. In the north-eastern part of African and particularly in Egypt, it rests, without any fear, on the palms and on the sycomores (Ficus sycomorus), which grow in the market squares, on the ruins of temples, on the roofs of houses, on the pigeon houses which it utilizes as starting points for its hunting expeditions. It is quite sure that, should its capacity of adaptation have not been so developed, the peregrine falcon would have not been able to comply with so different environmental conditions and biotopes, and this would have meant a remarkable diminution of its home range. The falcon is from 38 to 58 cm long and weighs from 600 to 1.000 g. The female is always bigger than the male, which represents a somatic-sexual dimorphism. It is not bigger than a wild pigeon, but is much stouter than this one. In spite of the non excessive size, it is a terrible predator, in front of which all birds fly away, common ravens included. The only one who dares to face it is the Long-tailed Jaeger (Stercorarius longicaudus Vieillot, 1819), which, at times, even attacks its young. The wide wings of the Falco peregrinus, are triangular, often curved like a crescent; the short tail has a squared extremity, the chest is broad, the head is round and the neck is short. The upper part of the neck is grey-blue; the lower one is whitish, barred in black. The upper part of the head and the cheeks are black as well as the long “mustaches”, whilst the chin and the throat are white. It has robust legs, with sharp and hooked claws. They are carnivorous and, in liberty, may live, as an average, 10 to 15 years. Like all similar species, also the falcon hunts mainly while flying and, even if sometimes it seizes birds resting on the branches, rarely threatens those staying on the ground. If by any chance, it chases a bird on the ground, it shows itself clumsy and awkward and often the hunt is unsuccessful. The ornithological biologist Hoymer, who studied this bird from 1940 to 1976, relates of a peregrine falcon who rushed for at least fifty times on a dove resting on the ground, without being able to seize it. In another instance, he saw a falcon pursuing a sandpiper. This last one settled quietly on the water of a pond and the raptor rushed on him unsuccessfully. Discouraged by its useless efforts, the falcon went away. The sandpiper then flew away, moving towards the other bank of the pond. The falcon then tried again the attack, but failed again; after a series of ineffectual attempts, it definitively gave up. 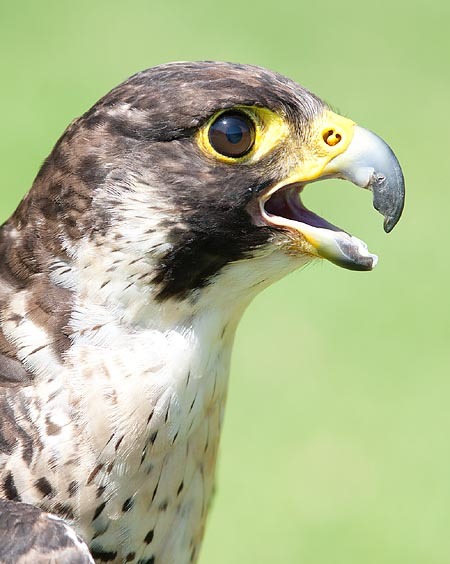 When the attempts of the peregrine falcon to seize a prey on the ground are unsuccessful, it resorts to the ruse. If you see a falcon resting in the middle of a field, it is sure that nearby stands a group of partridges. As soon as these ones fly away, the raptor easily seizes one of them, but if the group remains on the ground, it leaves them in peace. It pretends to be patient, deceiving them, keeping motionless for the whole time. When the partridges think it has gone far away, they take off, and at this point, one of them is surely seized and killed by the raptor. The pigeons pay a heavy toll on the nutrition of the peregrine falcon. This one follows their evolutions on the ground and in the sky while resting on a rock. Usually, the pigeons do not see it at once, but when they sight it is unluckily too late! Terrorized, they begin to fly disorderly in the air, without a destination or a precise escaping direction. Once reached the flock, the falcon rises of about 10 m on itself, showing its flying skill, points to a pigeon in the group and plunging obliquely toward the ground, following all the disorderly movements of the prey, gets to seize it. At times, the pigeon is manages to escape just before being seized, at this moment, the raptor, taking advantage of the speed gained in the swoop, picks up immediately without beating the wings, and then starts again at full speed. In less than ten seconds it reaches again the unfortunate pigeon, who, meanwhile, had thought it had saved. At this stage, the falcon folds the wings on the sides and kills the bird. As already mentioned, even the ravens and the big crows, usually brave, do not dare to attack it and fly away at full speed when they see it. Only the Long-tailed Jaeger (Stercorarius longicaudus Vieillot, 1819), attacks it bravely and pursues it in the tundra of the extreme north, sometimes even impairing its progeny. Once the falcon has seized the prey, it carries it in its cache holding it between the claws and kills it pecking it on the neck. If it is a heavy bird and therefore difficult to carry, the falcon hunts it lashing at full speed on its body and stunning it. The prey will fall on the ground more or less hurt and the falcon will eat on the spot, after having approximately plucked it. 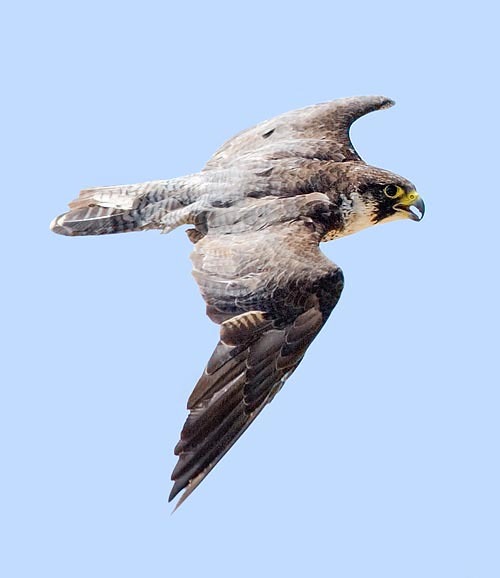 During a chase, a peregrine falcon reaches unbelievable velocities: you see an object coming down from the sky, you hear a sort of a whistle, but everything is so fast that you cannot recognize the raptor at once. Because to the astonishing speed it has which reaches the 300 km/h, it cannot catch the birds staying on the ground. Indeed, by swooping on an immobile prey, it would risk to crash on the ground! The German zoological biologist Peter Simon Pallas already in the past mentioned that, when a falcon pursues a duck, at times sinks in the water to such a depth that it is not capable any more to surface and therefore drowns. At times, being rapid, brave and much agile, it carries away the prey to the hunters who have just killed it. The reproductive cycle begins by the end of February. In this period the pairs occupy again the territory where they have nidified the previous year. Male and female, who, for the rest of the year keep fairly silent, become very noisy. For a good part of the day, their aerial evolutions are accompanied by high-pitched chirps. As already previously mentioned, the falcon does not build a real nest, it contents to dig a hole in the ground, usually in a location reachable only by flying, always in the territory where it lives. It may be an at least 50 cm wide rocky ledge, a hole inside a rock sheer or even an old crow’s nest. In the plain it takes advantage of the other raptors’ abandoned nests placed on the tops of the trees. In the steppes, it nidifies also on the sand. By the end of March, or by early April, the female lays 3-4 roundish eggs, with a yellowish shell, spotted of brown and red, which the couple alternatively brood for 28-30 days (per egg, seen that at times the incubation begins from the deposition of the first egg). Later on, both parents breed the young all together and the continuous comings and goings, often accompanied by sharp screams, reveals, from far away, the presence of the nest of this bird. The young lovely nourished with carefully plucked little birds by the mother, or, if she is absent, by the father. As soon as they have learnt how to fly, that is when about five weeks old, the parents teach them how to hunt till the end of July, when the family splits. The usual preys of the Falco peregrinus are pigeons, starlings, lapwings, partridges, skylarks and small waders. The do not disdain the small mammals (various rodents) and some reptilians. The falcon is the nightmare of the breeders of pigeons who, unluckily, try, in all ways, to kill it. Presently, the falcon is getting more and more rarefied (subspecies included), the population stands into the red list of the IUCN; this is a very dangerous fact for the balance and the ecology of the world avifauna. In North America, this reduction is already quite clear, as the ornithological biologists point out, but the thing is even more serious in Western Europe. In part this is attributed to the secondary poisoning by insecticides (DDT, dieldrins, HCH, etc.). These substances modify the metabolism of the calcium in the females rendering them sterile and therefore intoxicating them, and in the mean time block the spermatogenesis in the males. The phenomenon is spreading like a wildfire and for this the zoologists wonder if the Falco peregrinus is not a species condemned, irreversibly, to the extinction!